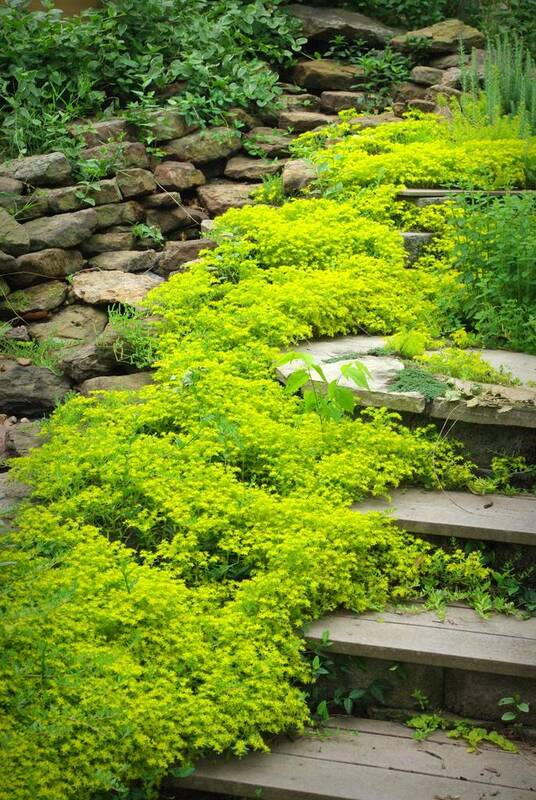 Stringy stonecrop, Sedum sarmentosum, is probably the fastest-growing sedum around -- at least in the cold-hardy species. 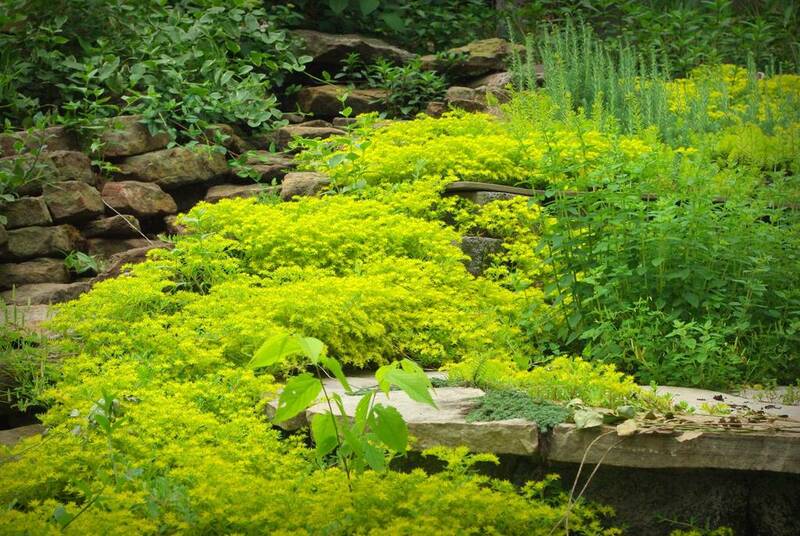 It's quickly taken over the entire stream area, covering the other sedum varieties, and leaving a blanket of yellow that is actually quite nice. I'll be ripping most of this out after blooming though, as it's just too vigorous. I haven't measured how far it will travel in a year, but it must be a couple of feet in each direction. The fate of the plants along the stream edge is one of the reasons I've put the rebuild project off so long, but this is not one plant I'm going to worry about. Does anybody grow this in a way that keeps it from taking over? I'd love to hear ideas. 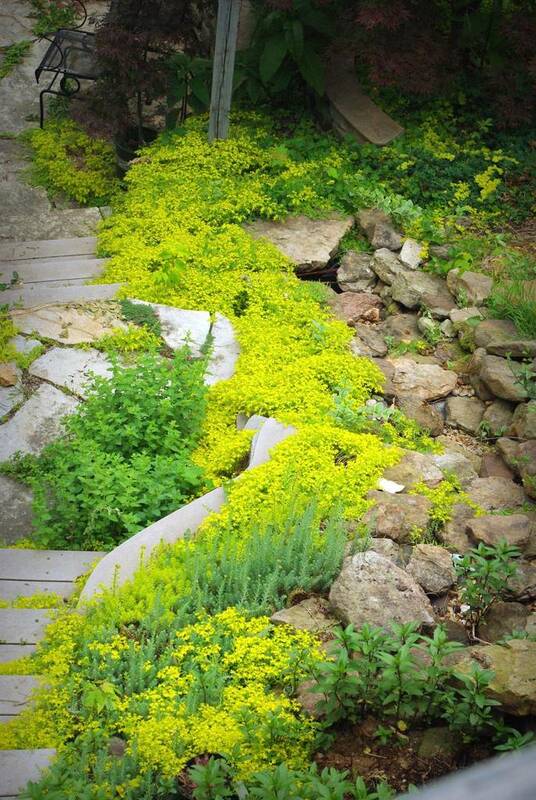 Despite your warning concerning the plant's invasive nature, I was impressed enough to check this Sedum out as something that might fill in a difficult area along my slope. It appears that it's not hardy in my zone 10b, which may be why I don't recall seeing it here. It's certainly attractive where you have it! 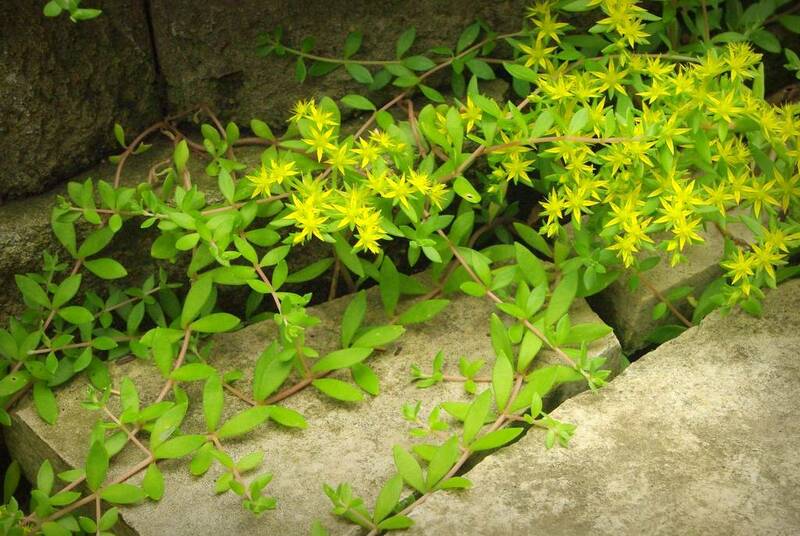 I grow it in three places with varying degrees of prettiness. On flat ground, I find it too long and spreading. I used to think too much shade was making it stretch out, but it seems that no matter where it is, it gets long after flowering. So I guess that's just part of its growth cycle. 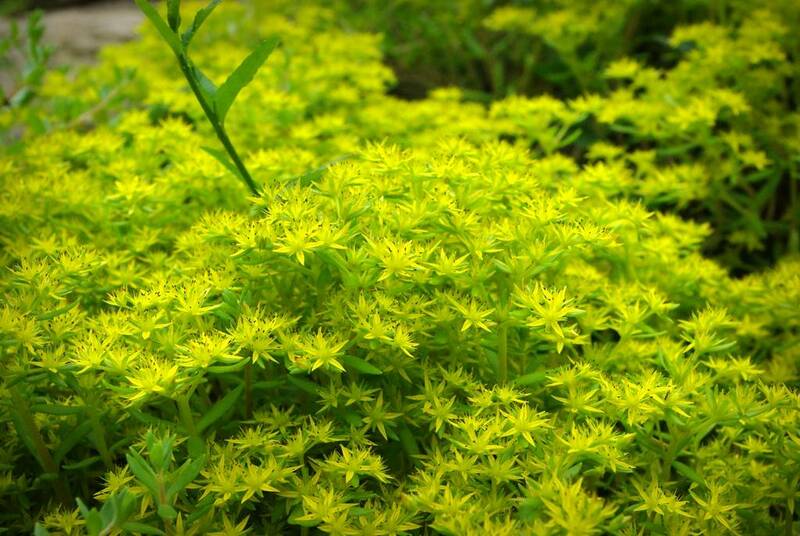 In my front yard, I'm growing it with about twelve other kinds of sedum with the hope that they can have a succession of flowers over time in yellow, white, and red. I'm trying to get a mixed carpet going rather than isolated drifts. The s. sarmentosum is by far the most representative and the least attractive. I've been considering relocating it. In my backyard I have a butterfly garden in a raised bed surrounded by mulch and then there's a dropoff of about three feet held up by railroad ties. Beyond that is the dumpsters and the alley (I live in the city). 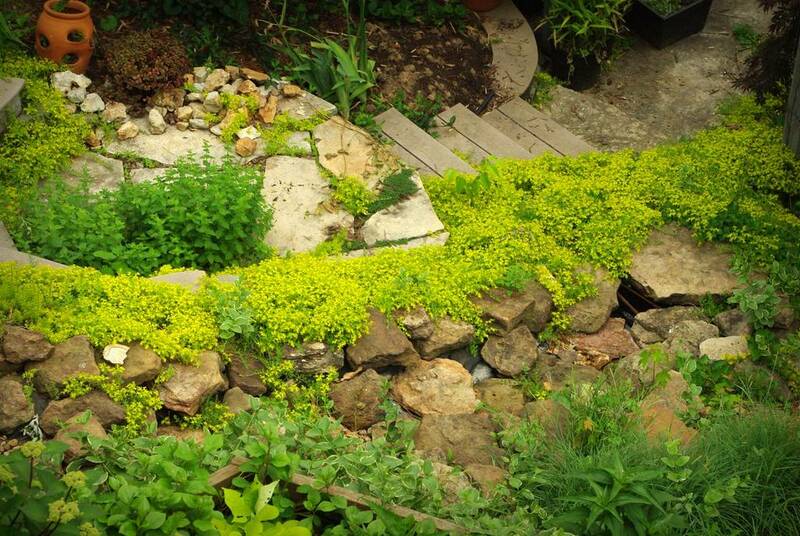 The sedum is growing beautifully in the railroad ties and overflowing from the edge of the mulch over the ties. Rather than sprawling across the yard, they're spilling into the air. So the yellow flowers form on big puffy balls sticking out from the wood. 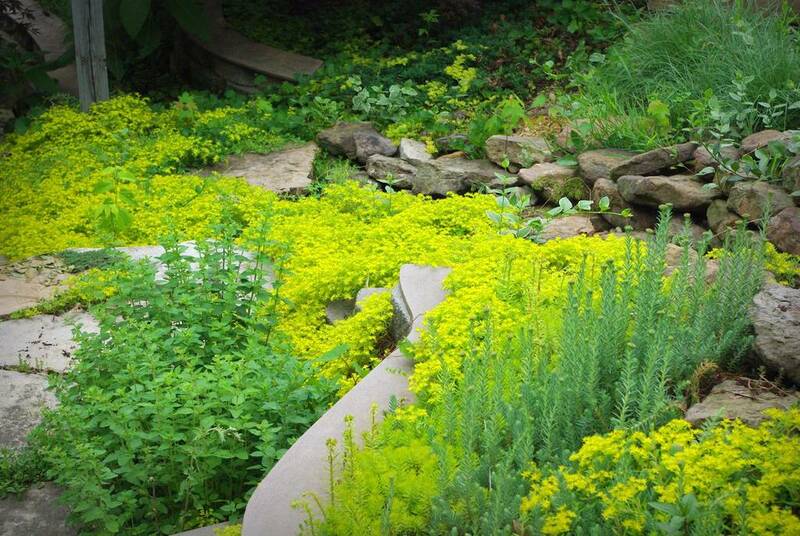 It won't spread far into the mulch because I walk there constantly to tinker with the butterfly garden. They're trapped, and they're wonderful. They hold the soil pretty well too. I layered cuttings and soil and they rooted immediately. Now little shoots are popping out of the holes. In my mind this will be a huge ball of yellow flowers one day. We'll see. So maybe try to plant them as plugs in a vertical surface somewhere. Daron: You *can* grow this mixed in with other sedums, as long as you remove lots of it to give the other "normal" species a chance. This will climb all over them and take over. 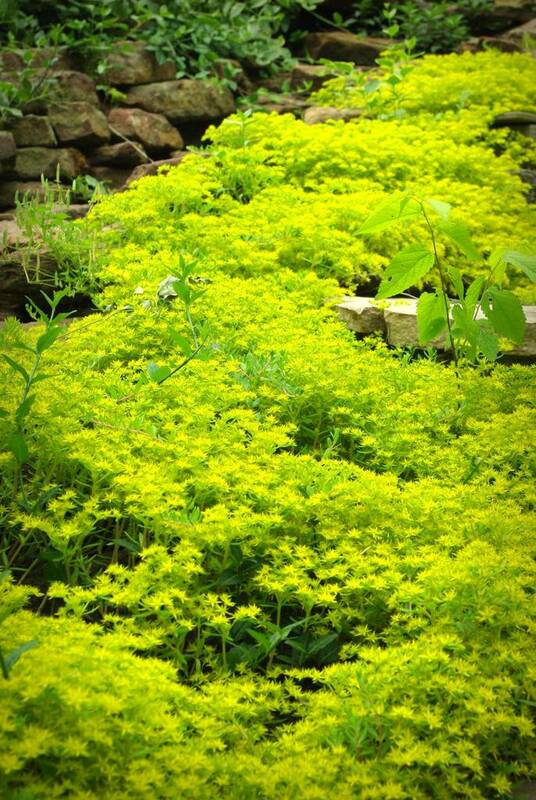 Kris: I don't want toi dissuade you from growing it if you have the right spot, just be aware that it will overpower other sedums and other small plants.